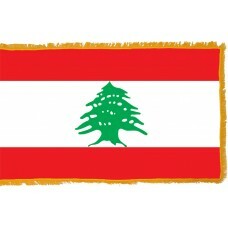 The Lebanon flag has three horizontal bands, in the colors of red, white, and red. The white band is double the size of the two red bands and in the middle of the white band is a green cedar tree. The red colors represent the bloodshed in the struggle for independence against the Ottoman Empire and the French, and the white color represents the snowy mountains of the country as well as peace and purity. 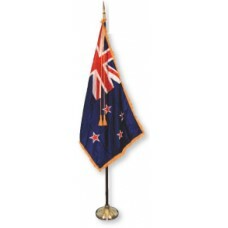 The Cedar tree is very symbolic to the country and the natives, representing holiness, eternity, happiness, and hope. There Cedar Tree is mentioned 77 times in the bible, one of them being: "The righteous shall flourish like the palm tree, He shall grow like a Cedar in Lebanon." 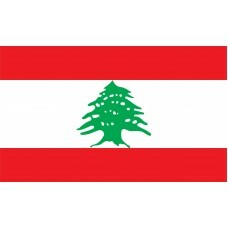 The Lebanon flag was adopted on December 7th, 1943. Lebanon is a country in Western Asia that shares borders with Syria and Israel as well as Cyprus across the Mediterranean Sea. The capital city of Lebanon is Beirut. 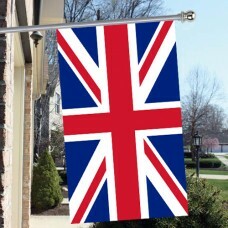 The country has been under the rule and control of 15 different nations and empires throughout history, dating back to the Greek and Roman Empire. In 1197, Lebanon was under the control of Egypt until 1516 when it was under the control of the Ottoman Empire. During WWI, Lebanon was in the middle of the battle between the Ottoman Empire and the British but remained under the control of the Ottoman Empire until 1918. In 1926, Lebanon became a French Protectorate and in 1939, the French tricolor was the official flag of Lebanon. During WW II, it was occupied by both the French and British forces until France declared Lebanon's independence in 1944. In 1946, all the French troops left. The majority of wars and battles that have occurred in Lebanon were religion-based wars. Following Lebanon's independence, parliament is now divided equally according to religious groups. Lebanon has 18 religious communities and the political system is referred to as "Confessionalism." However, there have still been struggles and battles since its independence due to religion, and between 1975-1990, there was a civil war between the Christians and the Muslims. Lebanon is referred to as "God's Country on Earth" as it is believed that it was God who planted the first Cedar Tree in Lebanon and it was also here that god was said to have created the miracle of turning water into wine. It is also thought that the word "Bible" is derived from Lebanon's city "Byblos" which is the oldest existing city in the world. The capital city, Beirut is another important city as it has been destroyed and rebuilt 7 times over the years and it has now become the 10th most popular shopping destination in the world.